Microsoft, the leading platform and productivity company for mobile-first, cloud-first world, has announced that it is joining its partners and customers at the IoT Expo 2017. As Internet-of-Things (IoT), artificial intelligence (AI), smart factories, and intelligent applications continue to advance, businesses are increasingly turning to these technologies to create new business solutions with greater agility and drive competitive advantage. The IoT Expo 2017 would provide opportunities for delegates to network and discuss on enterprise digital transformation using IoT technologies. Jason Zander, Corporate Vice President, Microsoft Azure, overseeing the development and global deployment of cloud infrastructure and technology, including Microsoft Azure IoT, will deliver a keynote on “Leading Digital Transformation and Landing IOT Value with a Strong IoT Partner Ecosystem“. In addition to sharing the success of Microsoft’s IoT Innovation Center and its partners, Zander will also provide Microsoft’s vision of the development of IoT and in-depth analysis on the integrated application solutions of the world’s leading IoT partners. Jason will also speak about digital transformation at the WCIT on September 12th from 11:00-11:30, focussing on how businesses can accelerate the growth of the IoT ecosystem. Microsoft launched its IoT Innovation Center in Taipei last October to spur development between IoT partners and international enterprises and organizations. In 2017, Microsoft will hold its second IoT Expo in conjunction with the World Congress on Information Technology (WCIT), a two-day event beginning September 11th. 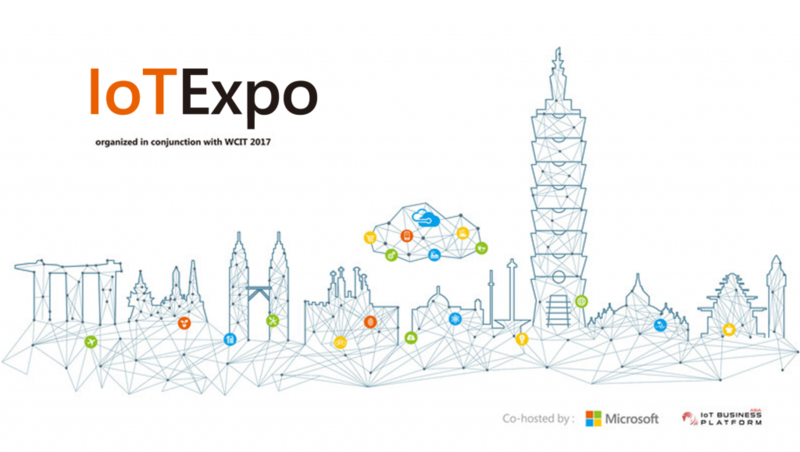 The 2017 Microsoft IoT Expo X WCIT will be held over two days, from Monday, September 11th to Tuesday, September 12th, at Taipei International Convention Center (No. 1, Section 5, Xinyi Road, Xinyi District, Taipei City). The IoT Solution Expo will take place at Zone D, Taipei World Trade Center Hall 1 (No. 5, Section 5, Xinyi Road, Xinyi District, Taipei City), which will gather global and local IoT partners in Taipei, showcasing IoT solutions and technologies.